The Canada goose (Branta canadensis) is one of the largest members of the Anatidae (waterfowl) family. Canada geese have a large degree of variation in size, travel habits, and location. The subspecies most recognized as a resident in Indiana is the Maxima or “giant” Canada goose (Branta canadensis maxima). However, seven subspecies of greater Canada geese exist in North America ranging in weight from approximately 3 to 24 pounds. Several different subspecies of Canada geese migrate through Indiana each spring and fall. However, the vast majority of the birds that stay in Indiana (resident geese) are the giant Canada geese. All Canada geese have similar physical traits despite size variation. Adult Canada geese have grayish brown wings, backs, sides and breasts; black tails, feet, legs, bills, and heads; and long black necks with distinctive white cheek patches that usually cover part of the throat. Males tend to be bigger than females though the two sexes’ physical traits are identical. Goslings, young geese, are a light yellow color with greenish-gray heads when hatched. As they mature, they become darker until they resemble the adults. Goslings attain complete adult plumage three to four months after hatching. The average life span of a Canada goose is 10-25 years. 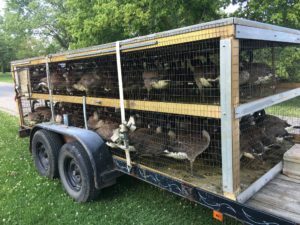 There are reports of geese living to be 30 plus years of age in the wild and an isolated case of a Canada goose living over age 40 in captivity. Adult Canada geese begin “pairing up” for nesting at three years of age though a few individuals begin this process at age two. Pairs usually stay together for life. If one member of a pair dies, the other goose usually finds another mate within the same breeding season. In Indiana, resident Canada geese begin “pairing up” for nesting in mid to late February. Nesting activities begin from mid March through late April. Once nesting has begun, the male and female will both defend the nest. The female lays eggs approximately every 1.5 days. Once the eggs are laid, the incubation process begins. The eggs are incubated in the nest for 28 days. The average clutch size is 5 eggs though variance from 2-12 eggs is possible. The nest size is variable and can range from 12-40” in diameter. The nest is usually constructed in a bowl shape of grass materials and feathers from the female’s breast. All of the eggs are hatched at the same time so that the adults can lead the goslings away from the nest. If the nest is destroyed, the pair will generally begin re-nesting at or very near the original nesting site. 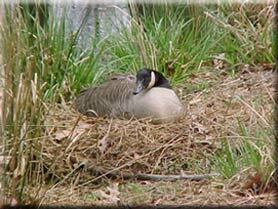 Canada geese have a greater tendency to re-nest if the original nest is destroyed earlier in the nesting cycle. Both adults, especially the male, vigorously defend their broods for approximately 10-12 weeks after the goslings hatch from the eggs. This defense behavior diminishes as the goslings grow older and are capable of flight. It is common to see several broods of goslings together, termed gang broods, during this timeframe. Gang broods may range from 20 to 100 goslings following just a few adults. Gang broods are more common in areas of high nest density. This activity is observed in urban and suburban areas frequently. 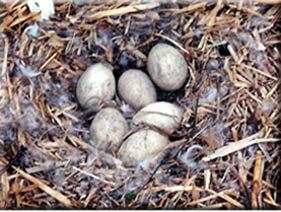 Canada goose nest site selection can be variable and highly adaptive though the nest is nearly always within 150’ of water. Some ideal nesting sites for Canada geese include: islands on bodies of water; muskrat houses; artificial nesting structures; along distances of shoreline (usually with some form of vegetation or structure immediately adjacent to the nest); at the base of mature trees; under shrubs; in thick aquatic vegetation such as cattails; in flower boxes and landscaping structure in urban and suburban areas; and in doorways or on structures, especially rooftops, in urban areas, i.e. anywhere that would provide them concealment. Canada geese are grazers, chiefly vegetarian though fish or insect matter is reported in trace amounts as part of a Canada goose’s diet, and consume many types of grains, grasses, seeds, sedges and other aquatic vegetation, legumes, succulents and their vegetative structures. Canada geese can often be seen in waste grain areas, i.e. corn, wheat, soybean fields, feeding in mornings and late afternoons. They may graze in fields of wheat in the winter but grazing at this time does not cause yield loss. In the summer months when waste grains are not available, Canada geese feed on aquatic vegetation, succulents, forbs, and grasses. Often lawn grass is preferred by Canada geese in urban environments. Canada geese choose to feed in areas that are relatively open so that they can see potential predators and other dangers. All birds go through a molting period each year to replace damaged, lost, or deteriorated feathers. Waterfowl go through a second molt each year. During the second molt, waterfowl go through a complete molt and replace all flight feathers. Adult Canada geese undergo this complete molt during the summer months. This typically takes place in late June and early July in Indiana. This complete molt usually takes about one month for each individual bird. Non-breeding yearlings, adults that don’t nest, and adults whose nests have been destroyed are usually the first to molt. Adults with young will molt at the brood rearing area shortly after the non-breeding geese initiate their molt. Canada geese select open areas near water and a food source to molt. This allows the geese to walk or swim everywhere that they need to during their flightless period. Essentially, they put themselves within walking distance of food and have an unobstructed view to avoid predation and other dangers. Farm ponds and pasture fields serve as excellent locations to Canada geese during this phase of their lives. In urban areas, mown lawns, parks, and golf courses suit their habitat requirements. This molting period is a critical time frame in many nuisance goose management schemes. If timed properly, all Canada geese at any specific location are flightless. This flightless period makes the geese much more susceptible to capture. Canada geese are well recognized for their large V-shaped flocks as they migrate south in the fall and north in the spring. However, the giant Canada goose subspecies doesn’t migrate or migrates only short distances across a state or to a neighboring state. The smaller sub-species of the Canada goose, usually of a more northern orientation, as well as Cackling geese often migrate greater distances. Beginning in the northern provinces of Canada and ending in the southern United States, Gulf of Mexico, and extreme northern Mexico only to return back to their starting point in the spring. However, most resident Canada geese in Indiana migrate only when weather conditions force them to move south for food and open or available water. Nonetheless, migratory Canada geese generally pass through Indiana each spring and fall as the weather changes. Generally speaking, the migratory Canada goose population, though varied, is substantially lower and of elevated concern compared to many populations of the giant Canada goose found throughout much of the central United States. This differentiation in migratory Canada geese and resident Canada geese coupled with the different subspecies similarities makes management of Canada goose populations very difficult. Often it is the resident Canada geese that create nuisance situations during the nesting and brood rearing season in Indiana. However, large flocks of migratory Canada geese can be of occasional concern. This happens when large sums of migratory geese arrive at a specific site to rest over on their journey, often decimating vegetation at the location where they stopped. Mortality of Canada geese decreases drastically after the birds reach adulthood. The survival rate of first year resident geese is variable. It is known that survival rates of first year resident geese are substantially lower than that of adult geese. Survival rates of adult resident Canada geese within Indiana is greater than 90 percent. Meanwhile, survival rates of migratory geese range from 70-90 percent through Indiana’s range. Many factors contribute to mortality of Canada geese including predation, hunting, disease or illness, as well as natural causes. In urban areas, low predator rates and lack of hunting opportunities may artificially inflate the number of first year resident geese that survive to adulthood. The Canada goose population in Indiana has grown substantially over the last two decades. 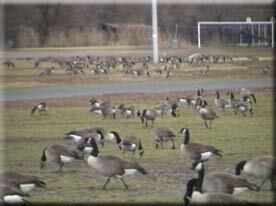 The current population estimate of resident Canada geese in Ind iana is approximately 130,000. This does not include the migratory geese which pass through Indiana each spring and fall. This population estimate simply represents the number of Canada geese in the breeding population in Indiana. Current trends in nuisance goose complaints, especially in urban areas, suggest that the actual figure may be higher than breeding estimates indicate. Data is incomplete at this time concerning the success rate of nesting for resident Canada geese in Indiana, especially in urban environments. Nonetheless, it is widely accepted that lower predation rates and lack of hunting opportunities may contribute to the species rapid population growth in urban areas.